If you’ve been shopping for Diptyque candles this past year then maybe you’ve noticed three boutique exclusives that seem to go in and out of stock: Tilleul, Foin Coupé, and Mousses. These three candles are part of Diptyque’s Herbal category. I was able to get one of each candle with some determination and persistent shopping. I’m happy I have these to complete my collection, but they are not scents I would be drawn to ordinarily. The Herbal category as a whole is really interesting but tough to talk about as a cohesive group. So let’s look at these three candles individually. Tilleul, meaning Linden Tree, is the most floral of these three candles. In fact, I don’t know why this candle is not in the Floral category. 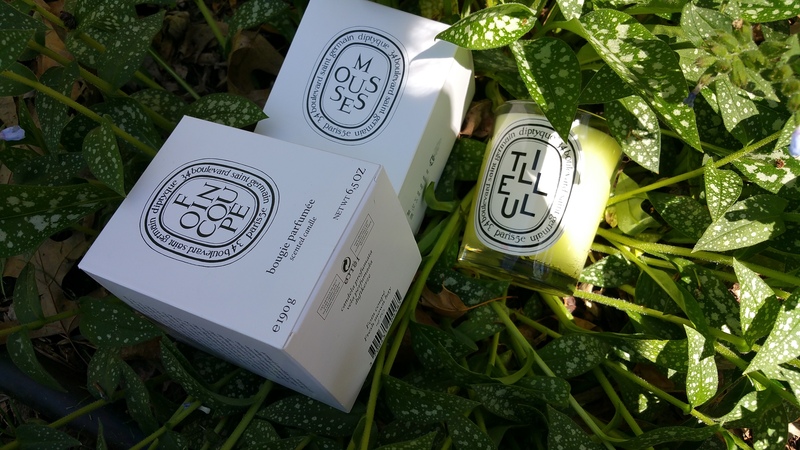 (Another Diptyque mystery…) Tilleul is yet another candle that smelled familiar to me out of the box. I take this to mean that Diptyque has done an impeccable job of replicating a natural fragrance. Note that there are “tree” candles in Diptyque’s Woody category, such as Santal and Chêne, but Tilleul is clearly not a woody smelling candle like they are. However, if you want to smell “Spring” then I would point you towards Tilleul. As Diptyque says, it smells like the blooms of Springtime: “The spring months are drawing to a close. In the woods, an unforgettable fragrance is released by the flowers of a linden tree.” Tilleul reproduces that joyous sensation of smelling something pleasant outside but being unable to find the flower that is producing the perfume. As you walk down a lane, Tilleul is that intangible cloud of scent that is subtle one minute and strong the next. I grew to like Tilleul more as a I burned it, but it still isn’t a favorite. However, I am regretful that it isn’t part of the permanent line up, because I am sure it would be the favorite of some noses out there. Then there is Foin Coupé, another candle that evokes thoughts of a season. But this time the season is Summer. Foin Coupé, or “Fresh Mown Hay,” may resonate with you if you grew up near a farm. As I did not, I wasn’t sure what to expect from this candle. Diptyque says the scent is “(a) mix of cut grass and wild flowers.” And “it directly transports you to the time of grain harvesting.” With that description in mind, the sweetness of Foin Coupé surprised me. I have heard people say that grass smells sweet, but it never has to me. Grass has always smelled pungent and “green” to me. However this candle kind of side-steps that green aroma and seems to dial up dried hay instead. I’m not sure if that’s what Diptyque intended for the candle, as the description talks about “grass” but the name references “hay.” Something must be lost in translation. Anyhow, my point is that Foin Coupé comes across as more floral then green, and not at all herbal. So don’t be afraid to try this one. That said, it’s definitely not a favorite of mine or a candle I would reach for often. But the candle I would never reach for is Mousses. This is not because Diptyque made a bad candle. It’s because it really does smell like moss, and “(a)ll the fresh scents of the forest floor after the rain” while it is burning. I am not a fan of those smells. Strangely the candle smells sweeter when it’s unlit, but still very, very green and pungent. 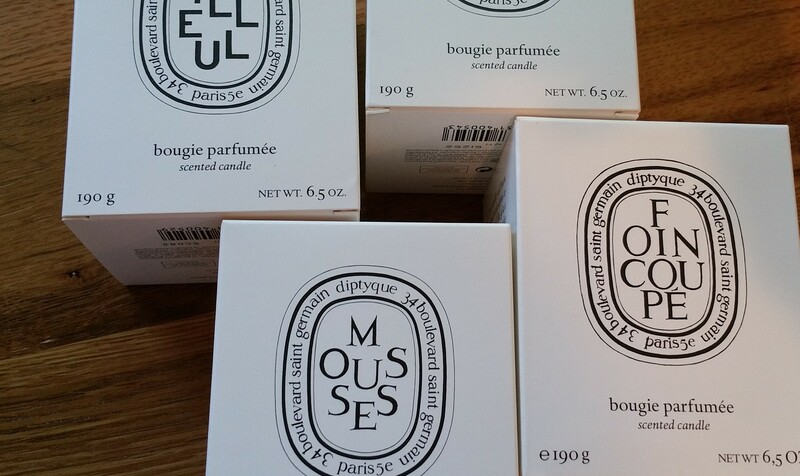 Mousses gives off those categories of smell that I had expected from Foin Coupé, but didn’t get. My husband, who is known to make flash decisions that I don’t understand, declared: “it smells like an old person’s perfume,” when I passed the unlit candle under his nose. I suppose I can’t prove an old person never smelled like this. But, yeah, honey, your statement is not at all helpful to me. So, my take on it is that Mousses is a totally bizarre candle. It’s certainly not a typical home fragrance. I don’t know what the target audience is for it. On what occasion would you burn a moss smelling candle? I wish I knew. 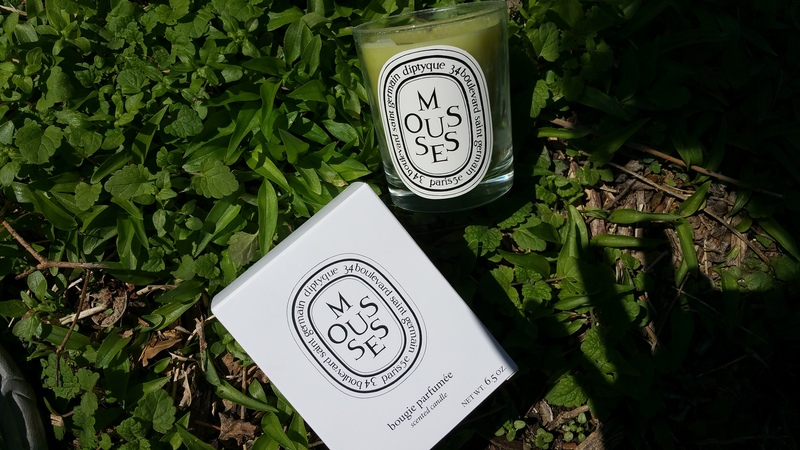 In conclusion, if you hadn’t already figured this out, Mousses is up there with Figuier and Oranger (both reviewed here) as a candle I utterly dislike. So now you’ve seen three of Diptyque’s herbal candles, but I hope you’ll hang on for the remaining candles in this category: Feuille de Lavande, Verveine, Coriandre, Patchouli, and Eucalyptus. Menthe Verte is also part of this category, but I already reviewed it here.